The end of days begins serenely, peacefully. Our rush through history has reached stasis; our glittering creations glibly sparkle, frozen in a time that stretches forever in every direction. Ronald McDonald smiles horribly, welcoming us to an eerie silence. Shangri-la serves Happy Meals. 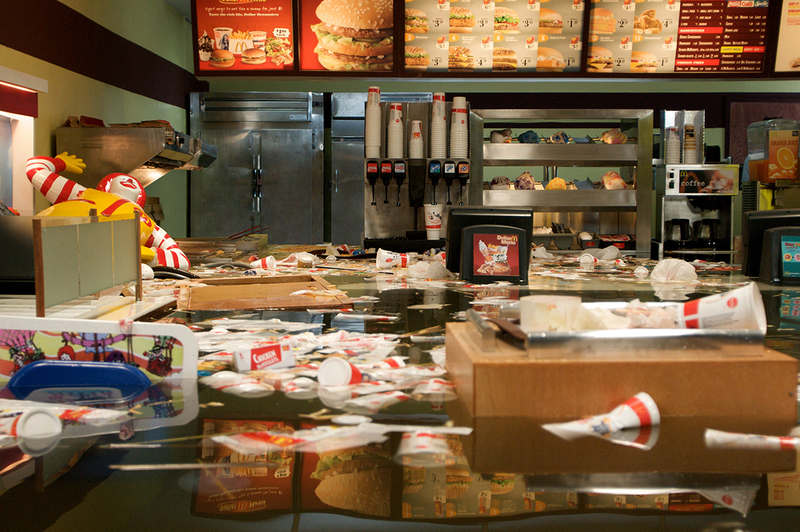 Superflex, “Flooded McDonald’s,” 2008. Filmed on RED, PAL, TRT 21 minutes. Courtesy of the artist and Peter Blum Gallery, New York. Water begins to seep into this hellacious paradise, slowly at first, steadily (perhaps anticipating Sandy’s wet vandalism). It slips across the floor, lapping and murmuring its way throughout the bright mausoleum. Low-lying trash is picked up in the water’s rise. Ronald begins to float across the floor, still smiling stupidly, his wave now transformed into a grotesque goodbye. A sign warns “CAUTION: WET FLOOR,” before it too is swept up. Above, all is peaceful, ignorant of its coming fate; below, stillness has become a slow-churning chaos. A useless cash register advertises the low price of Dollar Menu items that now float feebly by. The water picks up chairs and rushes into thirsty trashcans. Splish, splash, gurgle. Onetime employee-of-the-month Jorge Nguyen smiles proudly from the wall, before he, too, is washed away. Fries and cups and miscellanea everywhere: where did all this trash come from? The water welcomes lit golden arches into its soft embrace, and they fizzle and succumb to its ineffable logic. The chunky broth reaches higher still, finding the lights. Flicker, flash, and gone to Davy Jones. Darkness. Physicists foretell that our universe will one day burn itself out to a thin, empty subatomic soup. Endings aren’t always struggles or big bangs. When it is time for us to face our final reckoning, maybe we will tiredly accept the rising tide’s advance, and the world will spin on, ignorant that our plastic castles have collapsed under their own frivolous weight.